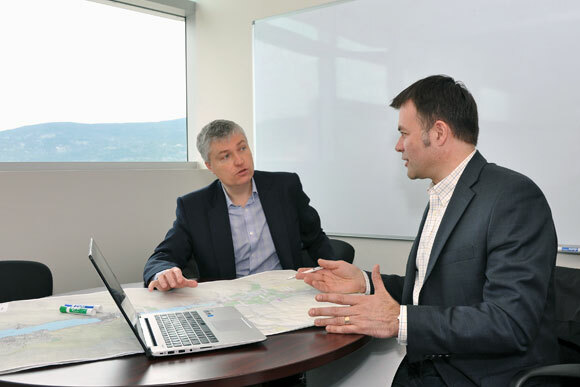 Okanagan Sustainability Institute director Keith Culver chats with Mark Holland, vice-president of development for New Monaco. Holland, a UBC alumnus, is excited about UBC’s research partnership with the District of Peachland and New Monaco. Taking the lab out of the classroom is becoming commonplace at UBC as academics strive to apply what they know to the world around us. For researchers with UBC’s Okanagan Sustainability Institute (OSI) and the School of Engineering, one of their current research labs is a sloping hillside in the northern part of Peachland. The 125-acre parcel is the proposed site of New Monaco, a multi-use urban development that will eventually see a fully sustainable community of more than 5,000 residents, commercial businesses, and light industry. Keith Culver, director of UBC’s OSI, says he is pleased with the distinctive partnerships formed between New Monaco developer Mark Holland, UBC’s School of Engineering, OSI, the District of Peachland, and organizations such as Urban Systems, Fortis BC, and Focus Energy Group. Researchers at UBC have received a three-year, $125,000 Natural Sciences and Engineering Research Council grant that allows a group of graduate students from the School of Engineering to look at several aspects of sustainable development. Engineering Professor Rehan Sadiq says the students are working on projects ranging from sustainable water and electricity supplies, wastewater containment and recycling, and transit. Urban neighbourhood sustainability has been recognized as one of the four emerging challenges for Canada in the next decade, says engineer Kasun Hewage, an associate professor. Residential, commercial, and institutional buildings and infrastructure require high volumes of energy and raw materials to construct, operate, and maintain. Hewage says his students are exploring specific ways to mitigate the amount of greenhouse gas emissions and general waste produced during construction and when the buildings are occupied. New Monaco, adopted into Peachland’s Official Community Plan in 2011, will be a community with mixed housing, commercial, and artisan light-industrial zoning with a projected 5,000 residents; doubling the population of Peachland and creating new employment opportunities for the area. District of Peachland Mayor Keith Fielding says the collaboration between the district and New Monaco is a good example of how communities and developers can plan for the future. Mark Holland, New Monaco’s VP Development and board director for the Urban Development Institute, says this project demonstrates the immense potential of strategic economic development in the Okanagan. “We have a world-class university, a local government, a utility, a major developer, engineers, and innovative researchers working together on a real community to drive market-ready innovation,” says Holland. Culver notes that this research will be invaluable for decades to come, as the goal is to provide results to all communities dealing with issues such as growth and sustainability. “It is information we will be able to transfer to any neighbourhood in Canada and comparable regions globally,” he says.